For three-quarters of a century, Wayside Waifs has been preparing pets and people for the bond of their lives. This year, as they celebrate their 75th anniversary, the nonprofit organization focuses on remembering their rich history while preparing for the next 75 years. Fenby Webster recognized that conditions for animals in the community simply weren’t right, and she sought to do something about it. With $5,000 and 28 other volunteers, 75 years ago, she purchased farm acreage along Martha Truman Road in Grandview to create the Jackson County Animal Betterment Association, which has grown to the almost 50 acres Wayside Waifs sits on today. The farm that Webster purchased served as Wayside’s shelter for the vast majority of the organization’s existence. At some point, the Jackson County Animal Betterment Association became known as Wayside Waifs, and the organization has always been an independent nonprofit. Expansion of the facility happened gradually overtime, as funding allowed. Hall said that the organization operated in this fashion up until the mid-90s. At that time, the Missouri Department of Agriculture said that Wayside was maintaining deplorable conditions for the animals in the organization’s care, and that a new shelter would need to be built or they would be shut down. The current shelter at Wayside Waif’s opened in 1998. Hall said that while the agency has had a good reputation in Kansas City since the beginning, the organization ran short of the goal to air condition the new building. That turned out to be successful local entrepreneur Harold Melcher, who, along with his business partner, was revolutionary in introducing the world to canned meats after World War II. At the time, the board member informed Melcher that there was a dog named Sophie at Wayside that he should come see. Hall added that Melcher was generous to the organization, but his involvement went beyond his financial philanthropy. He recruited his own friends to become involved with Wayside Waifs, and Melcher fell in love with the organization and found a way to utilize his expertise in entrepreneurship. Melcher, who turns 100 this year, served as Wayside’s board chairman for a number of years, and has since been named chair emeritus. 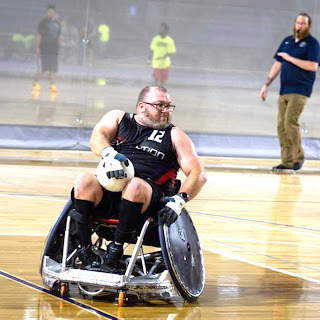 Hall said that Melcher’s influence has helped Wayside maintain its credibility in the community as being an exceptional organization, but the nonprofit continues to recognize that resources are finite. Every animal that comes to Wayside is homeless, which can be the cause of many different scenarios. Some come from unsafe or unhealthy conditions, some are cases of neglect or abandonment, and others the volunteers or staff simply don’t know why or how they got there. Wayside maintains a nearly 98 percent live release rate, which means the animals that come to the shelter leave as pets. The organization is a managed-admission shelter. They control the intake of animals in order to provide the shortest stay possible for each pet, providing the opportunity to care for more animals over time. Working strictly with domestic animals, the average stay for each pet is right around 13 days, caring for nearly 6,000 animals annually. Moving forward, and to fulfill what Wayside sees as a necessity in the community, the organization will soon embark on creating the Wayside K-9 behavioral center of excellence. The organization will scientifically produce approaches to benefit shy and fearful dogs into becoming more confident around people, and high-arousal dogs becoming more calm and peaceful around people. With that will come brand-new, dedicated facility for these two populations of dogs. Wayside has partnered with the American Society for the Prevention of Cruelty to Animals (ASPCA), which started a similar program a few years ago. SFS Architecture, out of Kansas City, will work with A.L. Huber contractors to build the facility. There will also be a significant expansion of the existing building to accommodate classroom space for public education like dog behavioral classes, and provide additional staff workspaces. Hall invites anyone who hasn’t experienced Wayside Waifs in the last several years to come out and see the facility and the grounds. There is a pet cemetery (even a monkey is buried there) that dates back to 1946, an off-leash dog park, and walking trails on the 50-acre site. He added that the most important part of the Wayside organization is the people. With a staff of around 75, and a regular volunteer core of 1,400, Hall said that a large portion of the people who do the hard work day in and day out also contribute to the nonprofit financially. 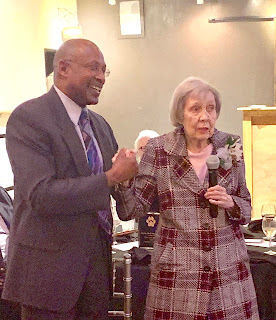 After receiving dozens of nominations spanning the country and the world, the Grandview Education Foundation recognized the first two Grandview High School distinguished alumni award winners during a dinner celebration on Thursday, April 4. Ina Jane (Billingslea) Bryan, class of 1947, and Leonard Jones, Jr., class of 1973, were honored among friends, family, business associates and peers with a presentation of their awards at The Martin event space in Martin City. Bryan, who currently volunteers with the education foundation, attended Grandview schools throughout her early education, then after graduating from Central Missouri State University in 1951, she returned home where she was offered a job to teach junior high social studies. Thus, her 40-year teaching career in Grandview schools began. In 1967, Bryan became librarian at Grandview High School, and she remained in that position until her retirement in 1991. 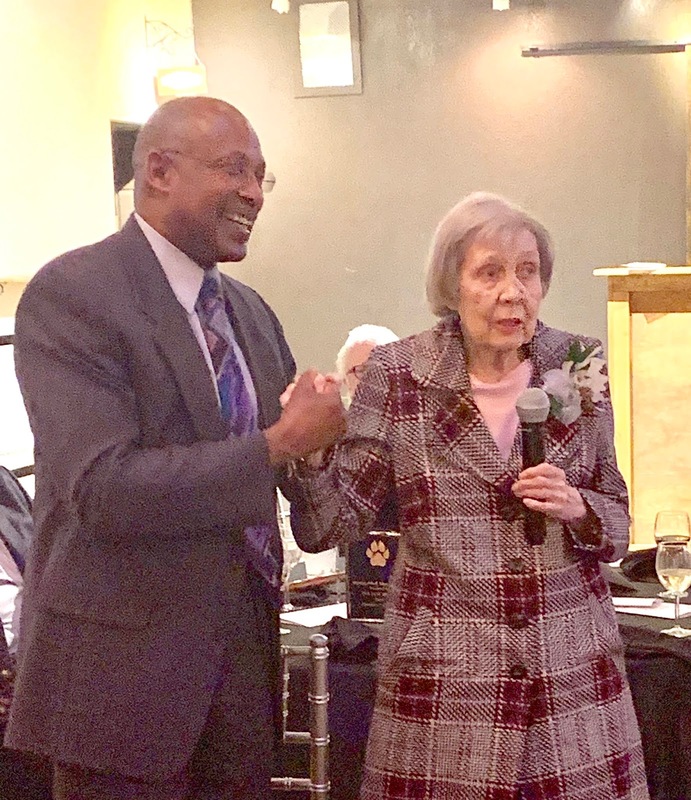 She went on to serve on the Grandview Board of Education, the Order of Eastern Star, St. Matthew Presbyterian Church, her sorority alumni club, General Federated Women’s Club, Grandview Retired School Personnel, and her bridge club, just to name a few. Mayor Jones has called Grandview his home for more than four decades. He was first elected to the Grandview Board of Aldermen in April of 1998, and was then appointed Mayor of Grandview on January 21, 2014. He was elected to that same role in April of 2014, and has served in the city’s highest elected office since, splitting his time between his careers at Sprint as a Sourcing Manager and leading the City of Grandview. Jones has actively served on many boards and commissions over the years, including: the Grandview Chamber of Commerce Board of Directors, Little Blue Valley Sewer District Board of Trustees, VFW post 8100 and the ReDiscover Board of Directors. He received the 2015 Distinguished Alumni Award from MCC Longview, and actively participates in municipal organizations such as the Missouri Municipal League and National League of Cities. The Grandview Education Foundation is planning to make the distinguished alumni awards dinner an annual event. Nominations for future recipients will be accepted by the foundation later this year. Going forward, according to the foundation board, the award will be named the Jane Bryan Distinguished Alumni Award. As seniors in Grandview approach their final quarter of high school before graduation, things like prom, college admissions, dorm rooms and summer jobs are likely at the forefront of these young adults’ minds. However, for Grandview senior Chayanne Sandoval-Williams, her thoughts are on what sort of legacy she can leave behind. Having just returned from a trip to Charlotte, North Carolina, where she received the National Center for Women and Information Technology (NCWIT) award for Aspirations in Computing (AiC), Sandoval-Williams has had doors open for her in the world of computers and technology in the last few years. But, she didn’t always dream of working in the tech field. She caught on, and somewhere along the way, technology became the forefront of her high school education. Sandoval-Williams said that here in the Midwest, girls going after the NCWIT award may not have the same access to opportunities as those from the coasts. She added, though, that whatever opportunities are given to girls like her, she sees them multiply the resources in order to accomplish great things. As the girls in technology programs continue to thrive, Sandoval-Williams said that they will begin leaving their marks and in the future, Midwesterners will see the same opportunities as those elsewhere in the country. Growing up in the age of dot com, Sandoval-Williams has had access to technology her entire life. During her eighth-grade year, she had a teacher who loaned her a book on HTML after she read a JAVA script book she checked out from the school library. During a break from school, she took the book and worked on learning HTML, building her first website. At that point, she said she still wasn’t sure that she would make a career out of this, as she was just playing around with what she had learned. Taking her first computer science class her freshman year, she was one of three females in the room. She said that what gave her an edge was that she took her interest in technology beyond the classroom. 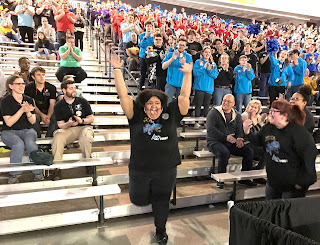 Due to the lack of programmers on the robotics team after a few months in, Sandoval-Williams learned how to program in just a few weeks and is, as a senior, now leading the show. She has implemented a robotics mentorship program with students in Grandview elementary schools. With the understanding that technology moves fast (adding that the first robotics team in Grandview wasn’t even implemented yet when she was starting kindergarten), Sandoval-Williams sees the need to inspire and motivate the next generation of STEM learners. Although, according to Superintendent Dr. Kenny Rodrequez, Sandoval-Williams is motivating more than just those in elementary school. Teachers, principals, counselors and district administration have all been impressed with the soft-spoken yet powerhouse of a teen that she is. Sandoval-Williams envisions Grandview being a hub for robotics and Project Lead the Way in the future. She is excited to see the district embrace STEM by beginning Project Lead the Way programming in pre-k classes. She was also selected as a recipient of KC Scholars scholarship, which would provide up to $10,000 per year up to five years of education at a Missouri post-secondary institution. Sandoval-Williams has her sights on something bigger for herself, though, and may be attending college out-of-state. She is looking at universities on both the east and west coasts, but doesn’t intend to make a final announcement until the official College Decision Day on May 1. Ultimately, after she goes off to college, and has several years of a computer science career under her belt, Sandoval-Williams said that her dream would be to come back to Grandview and teach. She said thanks to teachers she has had over the years, who have inspired her and pushed her to try new and different things, she would like to help inspire another group of students. Ideally, she sees herself in a remodeled version of her current teacher’s classroom teaching computer science. Her goals will remain lofty, and she said that she’d like to fulfill some of her passions like owning a restaurant and becoming a computer programmer first. Either way, she says, Grandview is and always will be her home. 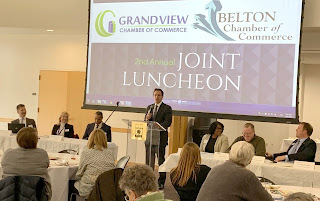 Grandview and Belton Chambers of Commerce have teamed up to provide their members a unique partnership opportunity with businesses in neighboring communities. On Thursday, February 28, the two chambers met for a joint luncheon, where leaders from both cities shared highlights from the past year and provided insight into what’s to come in 2019. The Belton Chamber of Commerce first kicked off the idea of joining forces in 2018, with plans to meet annually. Representatives from education, economic development, business relations and city management from both Belton and Grandview presented to the chamber members. Underwood added that with the latest Annual Performance Report for his district being at a 92.9%, Belton continues to aim for 100%. The district is also completing a $32 million construction project at Belton High School, which will provide a 9-12 grade building. “We’ve not been able to have that in probably the last 15 years,” said Underwood. The project is scheduled for completion in June, with opening by the 2019-20 school year. Alexa Barton, Belton City Manager, stated that one of the very first things she accomplished upon her new position was to introduce herself to Superintendent Underwood. Barton added that the district is the City of Belton’s secret gem. The city and the district are working on a collaborative marketing plan to let visitors and interested investors know that Belton is making great strides to improve its image and is open for business. She added that with commercial development, the city is also seeing new subdivisions taking shape. With the development of Southview Business Park, located just south of Grandview along I-49 and 155th Street, Belton’s jobs will increase by approximately 1,300, and residents will also see some infrastructure improvements. This will include a thoroughfare from 155th Street to 163rd. Barton said that this was absolutely necessary in order to provide access to the facility. Grandview Superintendent Dr. Kenny Rodrequez said that his district also works closely with Belton, and that Underwood serves as one of his mentors. He discussed Grandview’s three main priorities for the school year: college readiness, career readiness, and cultural competency. Rodrequez added that his district has increased ACT scores in the last three years by over a point, and as a whole scored over 90% on the state’s Annual Performance Report. His goal is to provide a path to college or career for every student in the district. The district is also seeking opportunities to work more with the community and further parent involvement. For the City of Grandview, City Administrator Cemal Gungor talked about the improvements on the I-49 Outer Roads to be changed back to two-way streets, along with the splash pad groundbreaking ceremony taking place this week. Nash stated that Grandview is included in the state’s opportunity zone, which was selected by the Governor to focus on the most economically deprived and underserved parcels of land. 161 designated opportunity zones were submitted by the governor, and with Grandview being on the list, Nash said that means the city will be able to keep its share of private capital investments made in the city. Belton will host next year’s joint luncheon with the Grandview Chamber of Commerce. For more information, follow either organization on Facebook. The district held a public forum on Tuesday, February 12 at Smith-Hale Middle School, to allow MGT to present recommendations, which included closing four of the district’s nine elementary schools – Truman, Symington, Dobbs and Johnson. The schools were selected based on a scoring chart that graded the schools’ condition and suitability. The chart showed that seven of the district’s schools were classified as poor or unsatisfactory in the suitability category. “Those buildings are actually serving as a barrier for educators to do the work that they are in charge of doing,” said Portia Bates of MGT Consulting Group. A learning environment can impact student performance anywhere from 12-20 percent, according to Bates. Only one of the district buildings is currently at the 85 percent utilization rate recommended by MGT. “Buildings that have low utilization rates really pull from your operational dollars,” Bates said. Moving the students into fewer buildings would save the district on busing, staffing and maintenance costs, according to Bates. A demographic study showed that the district’s enrollment decreased by about 1,800 students during the last 32 years. The district’s enrollment is projected to drop from 5,773 in 2018-2019 to 4,472 in 2027. John Sharp, a former Hickman Mills school board member, believes the projections are pessimistic, adding that residential projects and recent development of the city can help the student enrollment rate. Dan Weakley, Executive Director of Operations for Hickman Mills, said the district has a fiscal responsibility to use tax dollars in the best possible way for kids. He added that the data in the demographic study is extremely important in the district’s decision-making process. “We have had ups and downs in economic development over the last 32 years, but the one consistent thing that has happened during that time, is that enrollment has continued to decline,” Weakley said. An additional item to consider, according to Weakley, is reducing transportation costs and providing opportunities to bring students to closer proximity to their schools. In order to make up the other portion of the deficit, additional budget reduction recommendations by the district’s Executive Leadership Team include cutting travel costs, restructuring programs, decreasing building and district supplies, and reconfiguring grades. The cuts would equate to more than $3.3 million. The proposed grade reconfiguration plan includes moving pre-kindergarten to one building; having elementary serving students in kindergarten through fifth grade; Smith-Hale Middle School as sixth-eighth grade; and sending freshmen back to Ruskin High School. The district reduced the budget by $2.8 million last school year, according to Superintendent Dr. Yolanda Cargile. The district’s fund balance was at 8.5 percent at end of 2017-2018 school year. The fund balance for the end of 2018-2019 school year is projected at 9.1 percent. Hickman Mills’ goal is to eventually reach 15 percent. As far as possible layoffs, Casey Klapmeyer, Associate Superintendent of Human Resources and Accountability, said no decisions have been made. School board president Wakisha Briggs said the final decisions should be made in the best interest of the district’s future, which includes hiring teachers, investing in facilities, making sure their students compete well with neighboring school districts and improving community engagement and economic development in south Kansas City. “The number one goal for this district is to provide students with a high quality education, and we must figure out a way to stabilize our budget,” Briggs said. Bates and district leadership emphasized that the final recommendation could be different than the one presented at the forum. “We are not done with the options. The schools that you see proposed here may or may not be the final schools that are proposed to be closed,” Bates said. A final recommendation is scheduled to take place at the Thursday, February 21 school board meeting that begins at 6:30 p.m. at the Smith-Hale Middle School multipurpose room, 9010 Old Santa Fe Road. The Board of Education's vote, however, will likely not take place until a special scheduled meeting on Thursday, March 7. The Grandview Board of Education typically adopts the school calendar for the following year each January without much discussion, as the overall scope of it doesn’t change year after year. However, Grandview families and teachers will see significant changes in the 2019-20 school calendar. Districts in Missouri are required to provide 1,044 hours of student attendance, with no minimum number of days. School calendars must also include 36 make-up hours for inclement weather, for a total of 1080 hours. After several input meetings from district personnel and staff and parent surveys, a proposal to move to full day professional development was considered. The proposed 2019-20 calendar creates eight full-day non-student attendance days, eliminating all but two half days (during parent/teacher conferences in October and the final day of school). The 175-day calendar, which the district has had for many years, provided for approximately 1,091 student attendance hours. Although the draft 2019-20 calendar exceeds the number of state required hours, five minutes will need to be added to the daily schedule in order to maintain approximately the same state funding. Doing so provides 1092.16 hours, comparable to the current calendar. “How adding that five minutes plays out in regards to each school’s schedule, we’ll get into that later on as we’re developing this,” said Rodrequez. The district did its best in the calendar to keep the full days off on Fridays, providing for a long weekend for students. Non-student attendance days are designated as Professional Days. In November and April, they will fall on election days to alleviate safety concerns and disruptions to schools that are polling stations. The calendar also includes a transition half day for incoming sixth and ninth-grade students. All middle school and high school staff will be on site to help and support those students the day before classes officially begin on the first day of school. Elementary staff will have an additional half-day without students. The first day of school will be all day. The Board of Education unanimously approved the adoption of the 2019-20 school calendar with the proposed changes, and a copy of it will be available in the coming months on the district’s website. For firefighters, community engagement can come with the territory, but one local fireman is receiving national recognition for his involvement in Grandview. 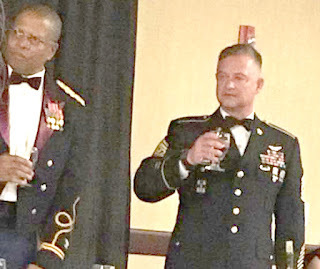 Service is second nature to Grandview Fire Department Engineer Rodney Baldwin, who was recently honored by the 7456th Medical Backfill Battalion Army Unit in Des Moines, Iowa, for his work with the Grandview Assistance Program. Baldwin also serves as Command Sergeant Major for his Army Reserves unit. On his last tour, he met Dr. Gary Morsch, co-founder of Heart to Heart International, who retired from the US Army Reserves in 2012 and has written a handful of books focused on humanitarian efforts. Morsch gave Baldwin several copies of books he authored and the two got to talking. At the time, Richards says, the Grandview Fire Department wasn’t doing much as far as community outreach or service projects. Baldwin began his career as a volunteer paramedic, and wound up working in Grandview because he thought he would see more action here. What started as a way to help his neighbors in the town he grew up in evolved into a career that makes him proud. Knowing that his friend Morsch was able to make great things happen in his own community with the organization he started, Baldwin knew he wanted to do something here. Wondering how the rest of his crew felt, he decided to go around and ask his coworkers why they joined the fire department. The first thing he did after the deployment where he met Morsch was research Grandview and its people. Seeing a great need for mentorship with students, Baldwin wrote a program, which has since developed into the Lunch Buddies in Grandview elementary schools. Wanting to find a way to help the families he serves, Baldwin organized a food drive for the Grandview Assistance Program’s (GAP) Back Snack program in the spring. This led into another drive in the fall for holiday needs. On December 1, 2018, Grandview Fire Chief Ron Graham traveled to Des Moines to witness Baldwin receive the Military Outstanding Volunteer Service medal, awarded for substantial volunteer service to the local community above and beyond the duties of the United States Armed Forces. Baldwin added that it is an award he’s never seen given before. The impact to the community from Baldwin’s efforts is immeasurable, according to Graham. The number of backpacks filled, hours spent with children, and pounds to food donated can likely be calculated, but the lasting impression on the community is what Baldwin was recognized for. Graham said that volunteering on their own time can be a hard sell for his crew members, but once they go and they see that they are needed, they fall in love with it. He added that the community service aspect has become a part of the change in culture in the department, and he thanks Baldwin for his role and leadership to make a positive impact. Baldwin is gone one weekend a month, or two weeks a year, for the Army Reserves. He works in a medical unit, where they are currently focusing on readiness processes for soldiers heading overseas. Back at home, and after seeing living circumstances in the community he works in, Baldwin has also begun other efforts to help GAP, including a coat drive. To help Baldwin and the Grandview Fire Department with future coat or food drives, follow them on Facebook.